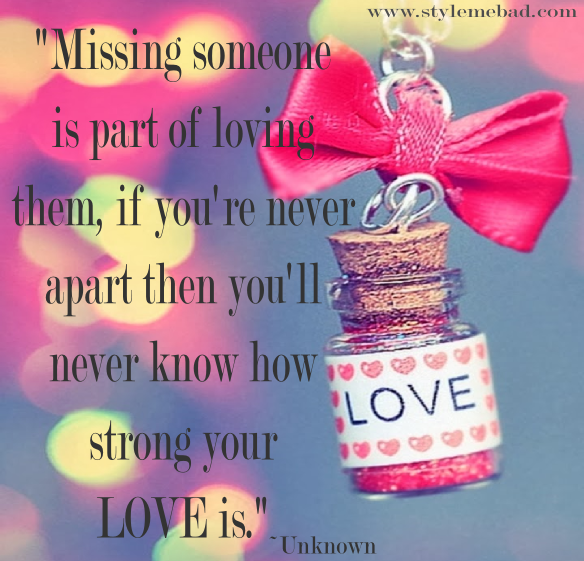 True Love Tuesday: Add Some Distance in Your Relationship | Style Me B.A.D. I have been in a somewhat long distance relationship for the past 6 years with my boyfriend living a little over an hour away. I know this is nothing compared to other long distance relationships, but it definitely still makes things a bit difficult. However, over time I have realized that the distance between us has helped to strengthen our relationship by improving our communication and trust with one another. This past weekend I went on a girls trip with my sorority sisters and put way more than an hour in between us. I can’t put it into exact words, but being so far away from your s/o that you see regularly definitely sparks feelings of appreciation for not only your relationship, but your partner as well. It can help to rejuvenate your relationship especially those of us in long term ones. I definitely recommend adding some miles in between you and your s/o to see how it makes you feel about one another. And if a trip isn’t something you can do right now then add some extended time in between seeing each other. It’s important to keep things interesting and even more so that you keep your independence! I completely agree! And, I think it’s really important that both people in a relationship don’t give up their life and friends for the person they are dating. Doing this will make it easier to have some time a part in the relationship to miss each other. Great post!! I currently do not have an s/o but I definitely understand how hard a long distance relationship can be. Previous PostStyle Me B.A.D. Celebrates 500th Blog Post!